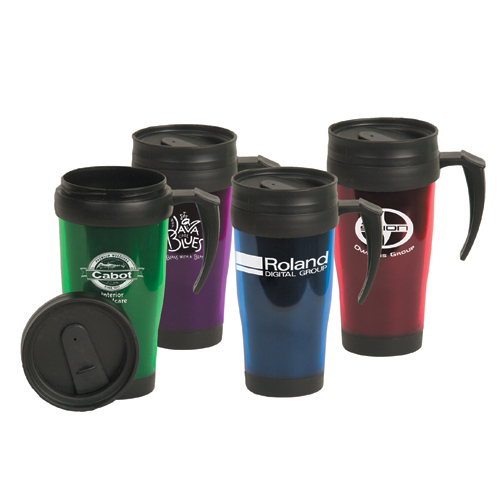 Translucent Mug 16 oz | Promotional Translucent Mugs 16 oz imprinted with your logo. Translucent Mug 16 oz, Translucent plastic mug with black handle and cover.This plastic drinkware beverage container is great to take in the car or use at home. Easy to take to the pool, beach, camping or to your next recreational outing. Available in Translucent Green, Red, Purple and Blue with Black Lid Only. Bulk / 20 lbs / 42 pcs. Price includes a one color imprint in one location. A set-up charge is additional at $55.00 per color/location. Multiple imprint colors/locations are available at $0.35/ea per color/location. PMS matching available at $50.00 per match. Malmo Travel Tumbler - 16oz.